We have come to drag days: It's autumn. And thoughts turn to nesting. Or is it jesting? It's autumn. And thoughts turn to nesting. Or is it jesting? 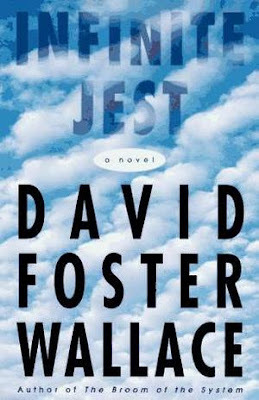 My dude and I decided we would be super geeks and together form a little book club to read Infinite Jest (members: me and him). It's my favorite novel, and he's never read it, and I've never read it with someone else, so I think it's going to be pretty fun. Just to whet the appetite I thought I'd flip the book pages, open to a random page, and type whatever sentence my eyes happen to fall on. I like to do this with books as a way to tell one's fortune for the day. Am I the only one who does this? It's also a great party icebreaker. MY FORTUNE!!! : "I commit no illegal or degrading acts. But I will, if forced, beg." Whoa. That was pretty intense, no? I think we all know what that means! Just kidding I don't really know. But I am all the more excited to start reading this book again.